I was lucky enough to visit this tiny Island in the Philippines. I booked this months in advance and during the half term as I was still teaching at the time. If I had known then that I would have more time off, I would have booked for longer than nine days! 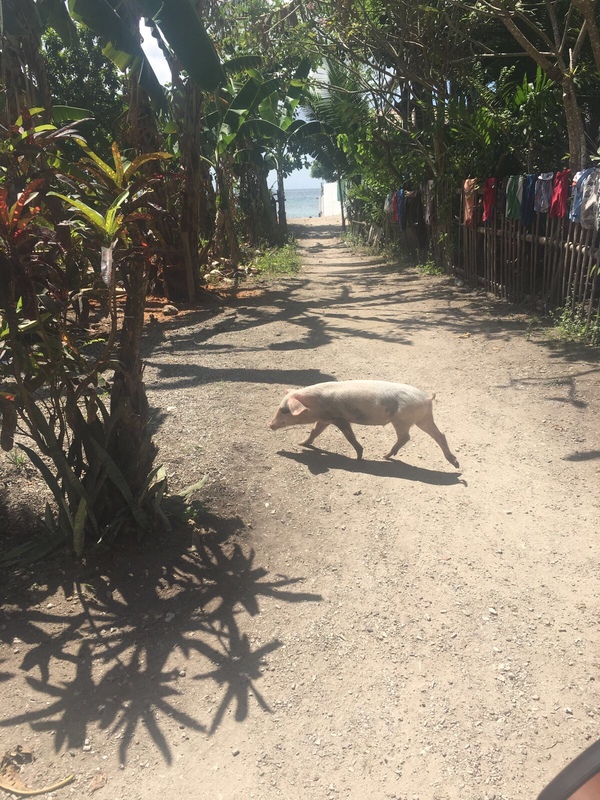 I would have travelled all around the Philippines – I loved it. My sister and I flew from London Heathrow, directly into Manila which took 14 hours. We stayed there one night and flew into Caticlan the next morning which took only 50 minutes. Manila is known to be dangerous and, as we arrived in the evening, we didn’t venture out too far. We found some nice bar/restaurants which were lovely and spent our evening there. We got an Uber (costing only £2!) from the airport to our hotel: Resort drive (4 stars and cost £34 for a double room). The currency is Philippine Pesos and I was blown away at how cheap our night was. February is a good time to visit the Philippines as it is the driest month with seven hours of sunshine. It is also a very busy month as it is half term for schools, valentines day on the 14th and also Chinese New Year on the 16th. 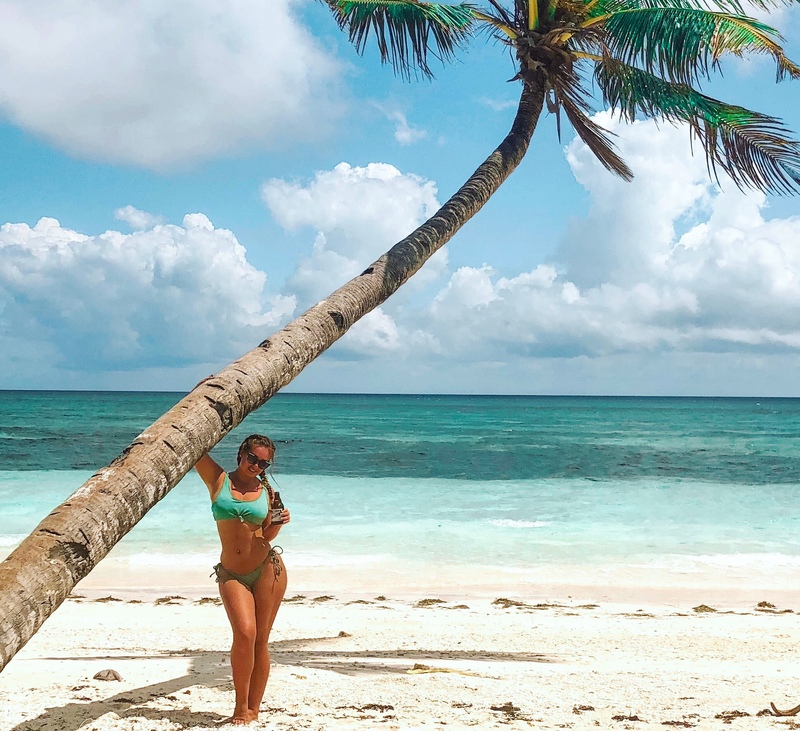 For the first few days it was quite over cast as there was a storm named Basyang which hit other parts of the Philippines – luckily Boracay was only hit with a few showers and grey cloudy skies. 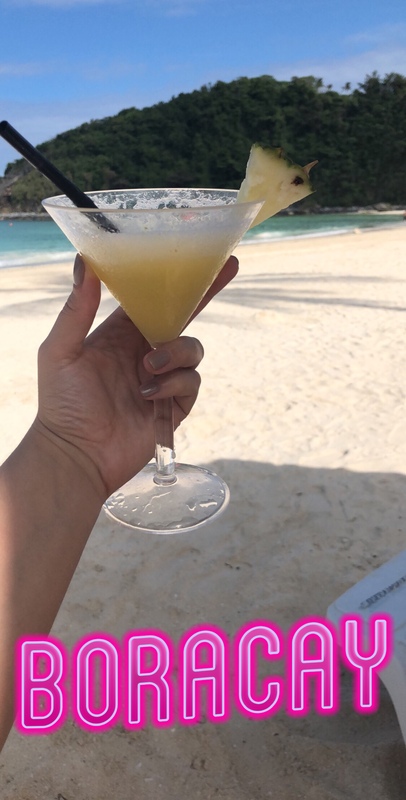 Obviously we did not let it stop us…we drank tequilas and watched the tropical rainstorms whilst sat under an umbrella at the beach – it was wonderful! Even with Grey skies the beach was so beautiful, but when it cleared up…WOW! 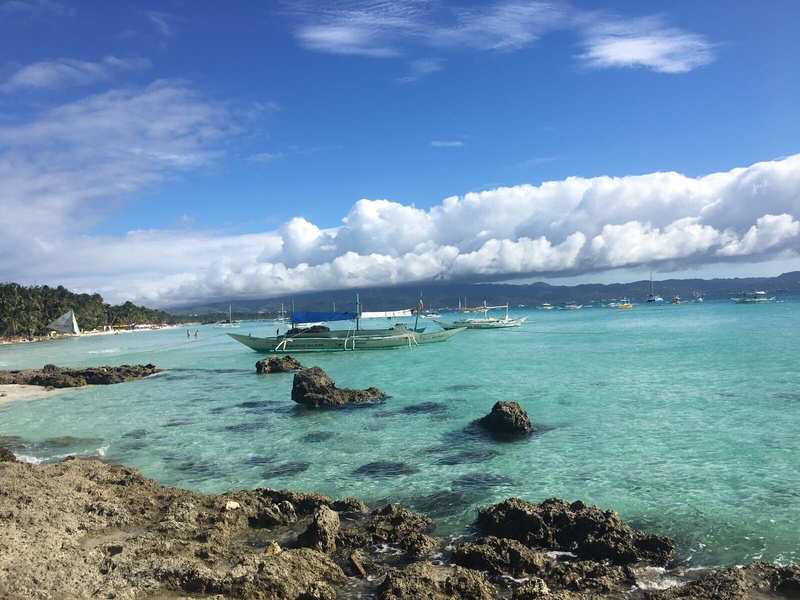 Boracay’s beaches are truly stunning! White beach is the most popular of Boracay. It is a long stretch of beautiful white sand and clear turquoise water, which is split up into three stations. Station one is where we spent most of our time. It has the nicest stretch of beach (although the whole of white beach is stunning) and it is quieter. Here, you can relax on sun loungers provided by the many bars and restaurants and not be hassled by locals trying to sell you things. Some places do deals where you get drinks included with your lounger. It is more pricy than the other stations, but also more luxurious. Station one is home to the famous Willy’s Rock. 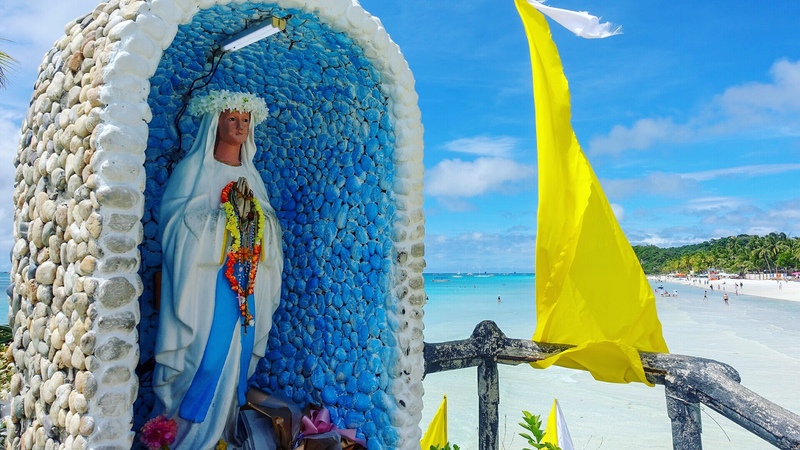 Here the virgin Mary overlooks the beach and people are free to go up and view. Just before station one, is Diniwid beach which is the quiet end of Boracay, with luxurious villas and hotels which give a peaceful laidback vibe. (check out the champagne brunch here). Photo of the rocks at start of Diniwid Beach. The rest of the beach is sand. Station two is the most busiest part of the beach, offering the best nightlife and bars. You can watch the beach transform from a sunbath heaven to a busy party as people flock in from other parts to dance under the stars. Good music, bean-bag bars, shisha, entertainment, you name it. You can get massages on the beach (day and night), find a range of restaurants and book your water activities here. You must visit D’mall which has many clothes shops, food spots and bars. Prices here are good, but for the cheapest local prices, Station 3 is the place to go. Station three is best for relaxing, here you can find many sun loungers and mix with jolly back-packers. The relaxing atmosphere has native style bungalows and many budget hotels – great if you are travelling long term, or want to save money. 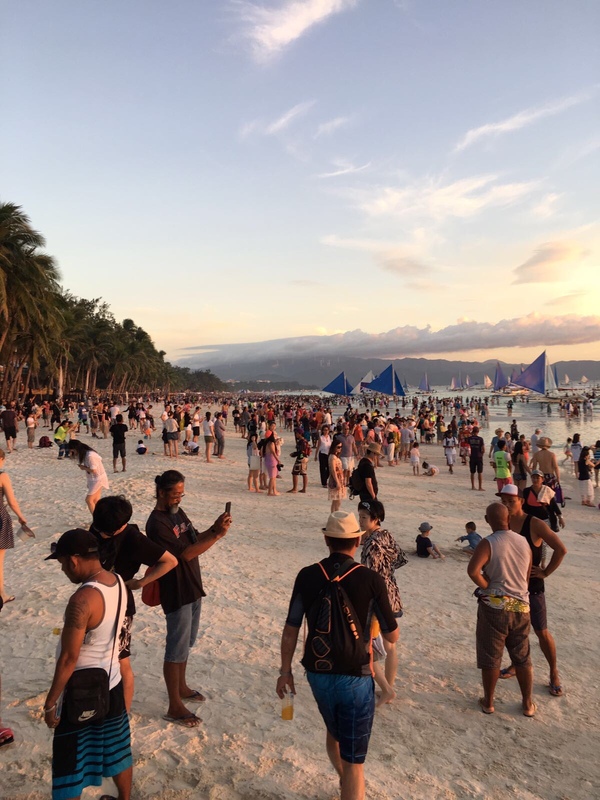 Of recent, a few of the nicest Boracay hotels have been built here and developed the area a little more, but you can still sense a different vibe compared to the other stations. At station three, you will find beach stools which sell unique souvenirs for the best price – I got five wooden Boracay key-rings which were hand crafted and personalised with names of my friends, for only 100 PHP. (£1.38! 1 pounds is roughly 70 PHP). You can also find beach accessories such as hats, t-shirts and beach floats. 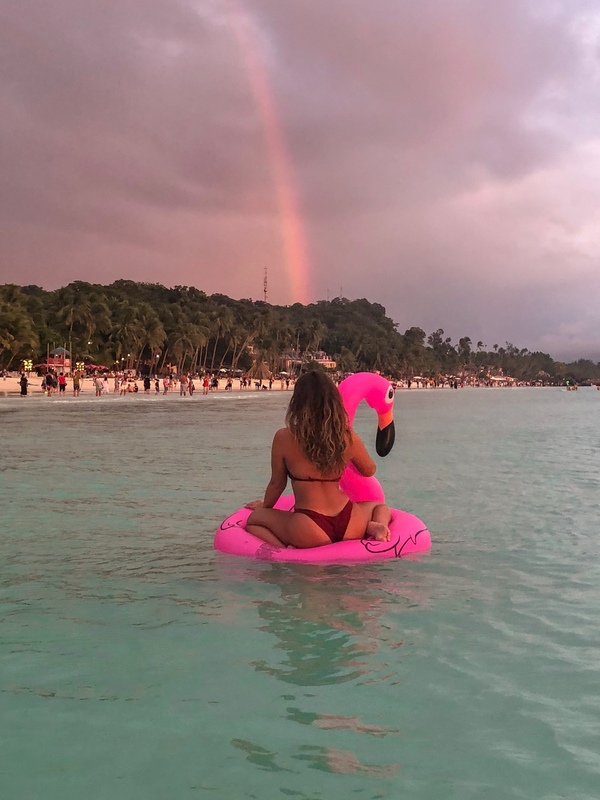 I adopted Bella the pink Flamingo here, and will be bringing her on my future travels – stay tuned for her next posts. Station Three beach bar, featuring Bella the Flamingo. 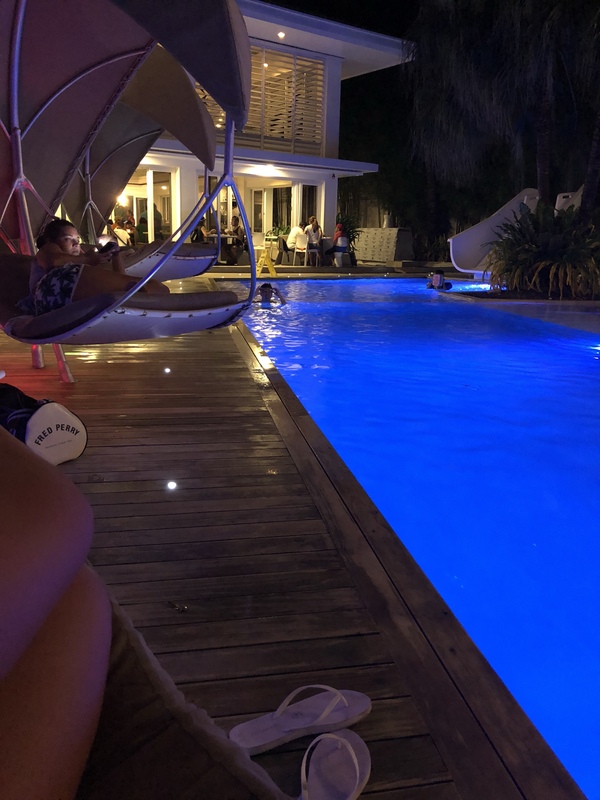 The hotel is HUGE, with several pools including a beautiful infinity pool, many different bars and restaurants, its own private beach and Boracay’s famous zip-line. 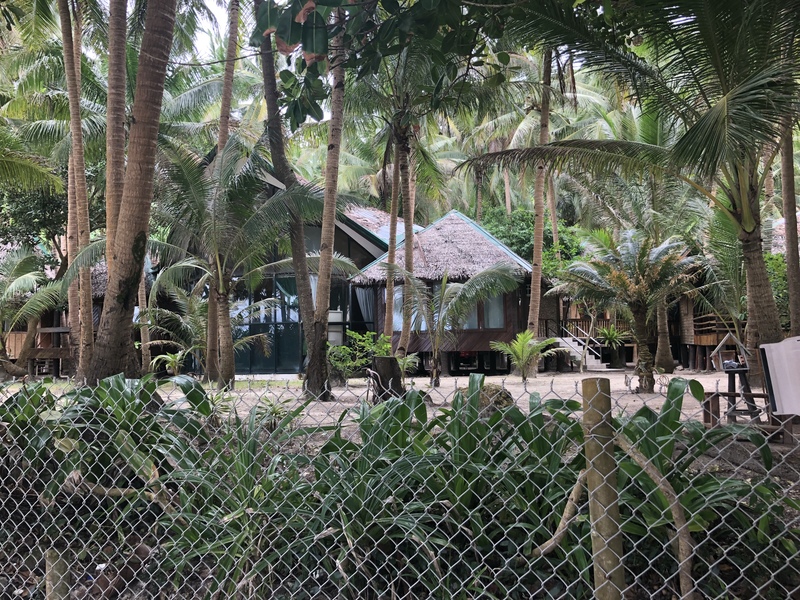 The internet definitely sold this hotel to us – great reviews and photo’s, however I did feel a little secluded from the rest of Island. (taxi drivers nicknamed it ‘far-aways’). You have to get a shuttle bus around the resort and it was quite time consuming as the grounds are so large. I would much rather had stayed in a hotel along White Beach. 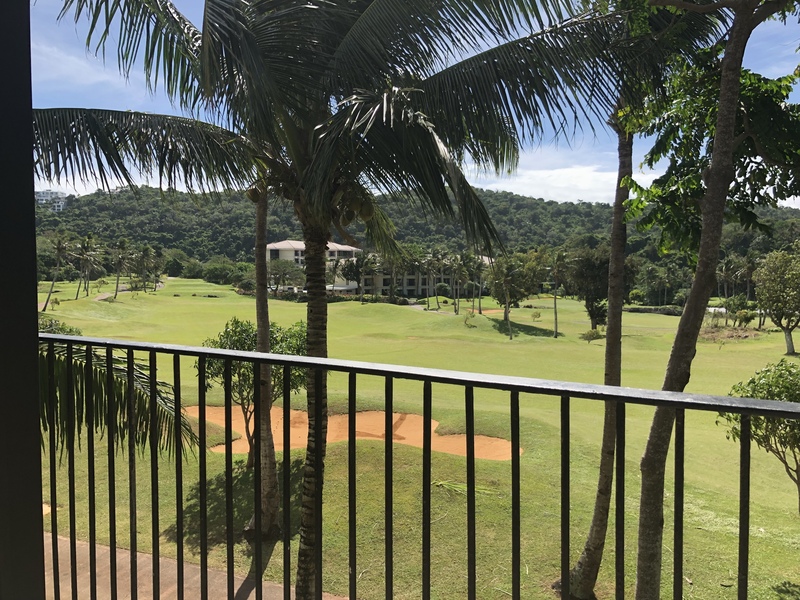 We were gutted to see the other hotels on White Beach that looked perfect, but none the less, Fairways and Bluewater is a safe five star hotel – Perfect if you would like to stay in the resort… But why would you?? As the weather got better, we decided to extend our stay. Philippine Airlines didn’t allow us to amend our flight, so we had to book a new return ticket (bummer!) but it was worth it. The only problem, due to it being a peak time, was there was no accommodation – the entire island had no vacancies except one hotel, Villa Romero. Would I recommend staying there? No. But it gave us a place to rest our heads at least. (price: £88 for three nights- two people sharing). boat trips- we did a boat trip to Magic island, where you can do cliff jumping – super fun with three levels, the highest level is ten meters. There is a lifeguard watching and life jackets available if desired. Our host arranged us a lovely barbeque of fish, prawns, chicken and crabs. The boats are a great way to go around and see the Island, and catch a tan at the same time. You sit above the water on the mesh seating, either side of the sail. You can get splashed by the waves which is refreshing. edit: you get soaked by the waves. Another amazing boat trip was to Caraboa Island. 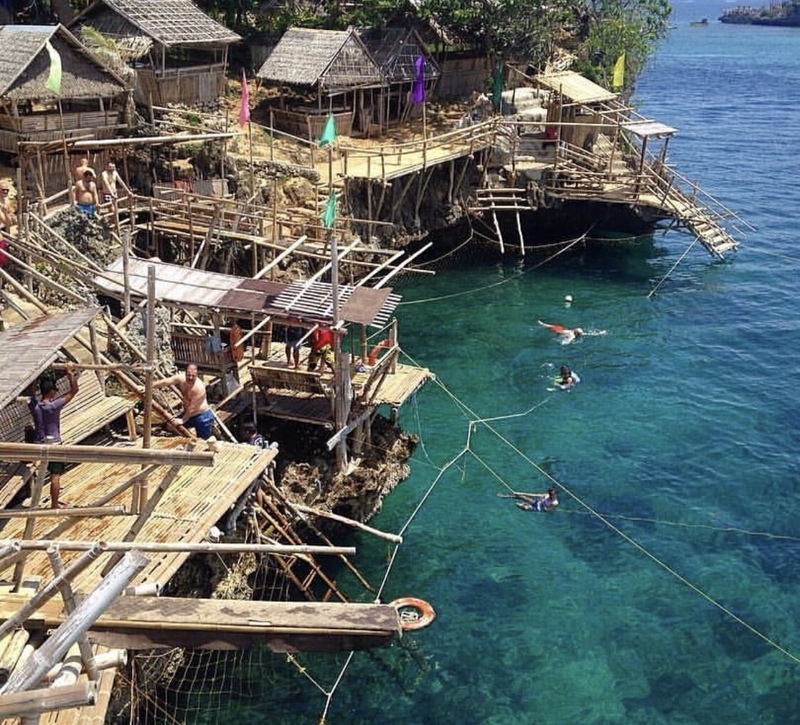 Escape busy Boracay for a more secluded, much more laid back Island. Here you will see many animals and a range of rocky or sandy beaches. I recommend doing a bike tour around the island – one of the highlights of my trip. You get assigned a driver and he/she will take you where you would like to go. To see the entire Island it takes about one hour. On the rocky side of the island, go snorkling and search for star fish. A great half a day trip. The beaches are empty and it feels like you are in heaven. Caraboa Beach – much quieter than Boracay. You can also visit Puka Shell beach, known for their unusual textured sand full of tiny shells. This is a short boat trip away, and all boat trips can be arranged on the beach. Another great idea is to do an afternoon boat trip, and view the most spectacular sunsets ever! The flaming shots at the Ambassador being prepared. Food at the Ambassador Hotel is also amazing. The music was chill and a bit of me, with performers in the evening. Did you know Filipino’s are fantastic singers?? To top it off, the views!! Best sunset I’ve seen hands down. 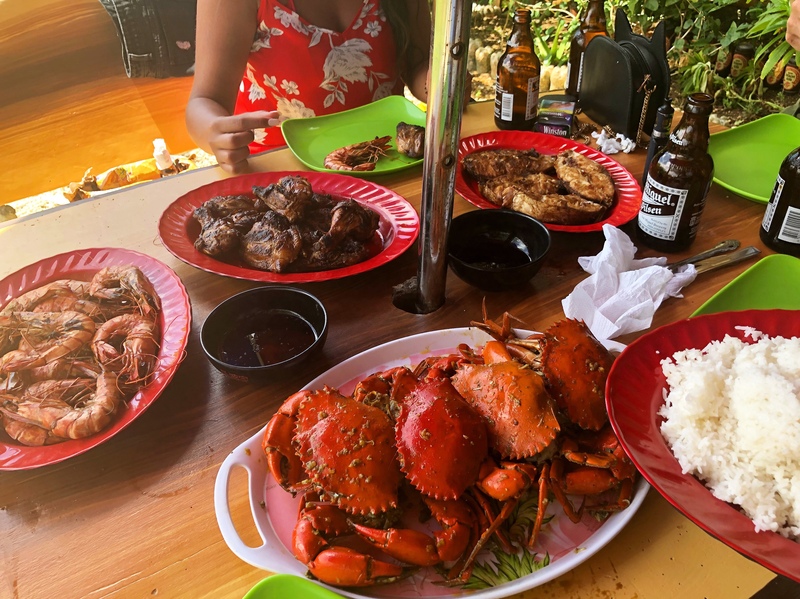 If you like seafood, in station three there is a fish market called D.Talipapa that’s definitely worth a visit. Its super clean and fresh as you can’t smell the fish smell strong in the air, and most, if not all, of the fish is still alive. You purchase your fish for a good price, and go a few doors down to the many restaurants that will cook your fish to your liking, again at a good price. D’mall is a good area to find many good restaurants (station two). You can also find souvenir and clothes shops. Its a busy area and its nice to have a walk around and see what is there. Whilst you are there, you should try the infamous mango ice cream at Halomango. It is very popular amongst visitors and locals, with long queues and happy customers. Its not milky, its not a sorbet – I don’t know how but its delicious. Mango ice cream at Halomango, Boracay. The beach has to offer a range of water sports. Parasailing is an exciting way to see part of the island from above. I would suggest you go at a reasonable time of day as the wait can be LONG – but worth it. You take a boat out to the floating platform in the sea, and you get given a number. It gets busy and it could be a while until your number gets called. My sister and I parasailing at sunset. Have you ever been Diving? If yes, you could go out to one of the many spots and dive down with the trust worthy instructors. If no, you can get trained and dive down to ten meters the same day. I wish I had more time to do this as I have never dived before (Done cage diving only). Dives are easy to book along the beach but try to book a morning dive for the best visibility. The rest of the days you could spend on the beach, at the pool, topping up your tan, playing beach volley ball or beach Frisbee with the locals (looks fun! ), trying new foods and just admiring the Island. There are around 7000 islands in the Philippines! 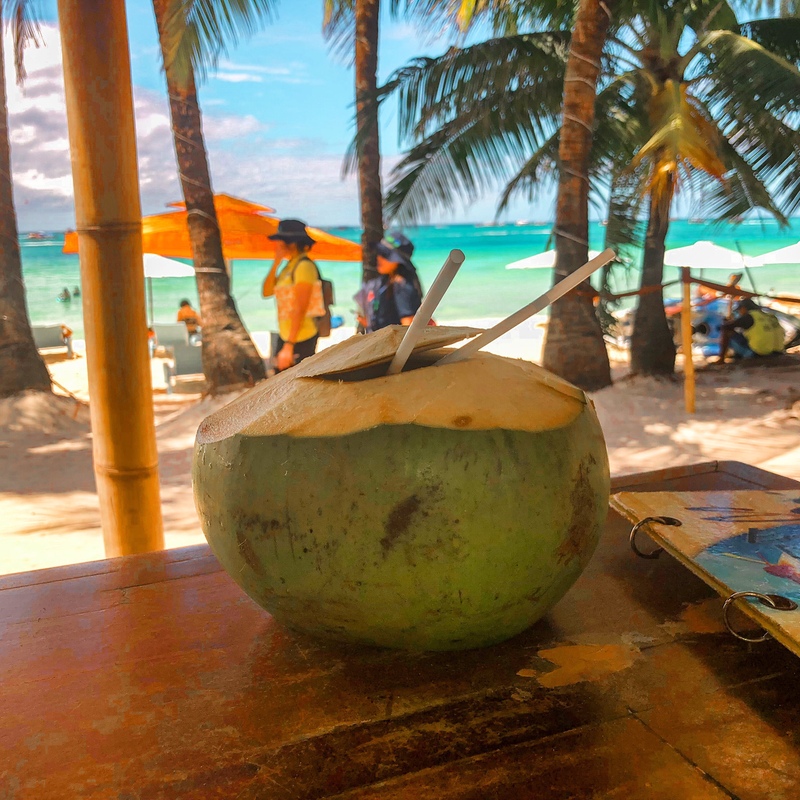 Boracay was the first and only island I have visited so far, but without a doubt, I will be going back! I long to visit the waterfalls, go whale shark diving and see what the other Islands have to offer. 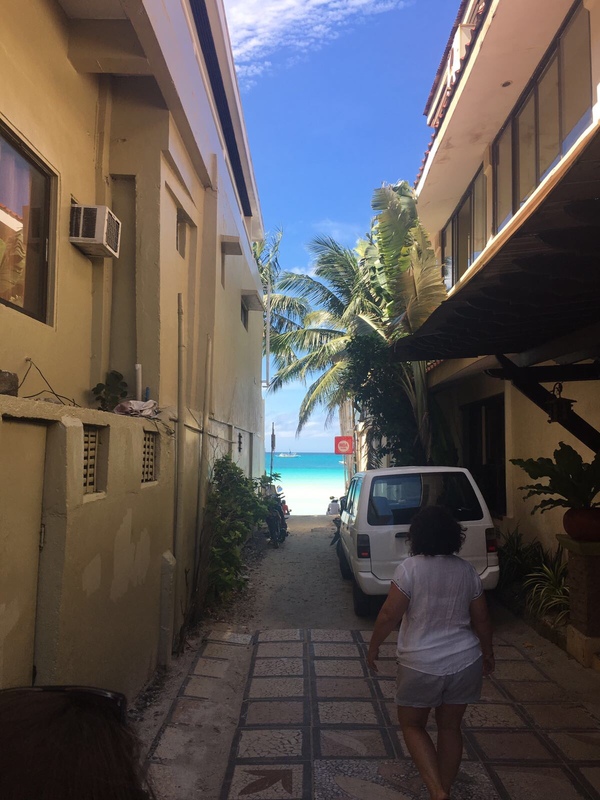 My overall experience of Boracay was fantastic yet eye opening. 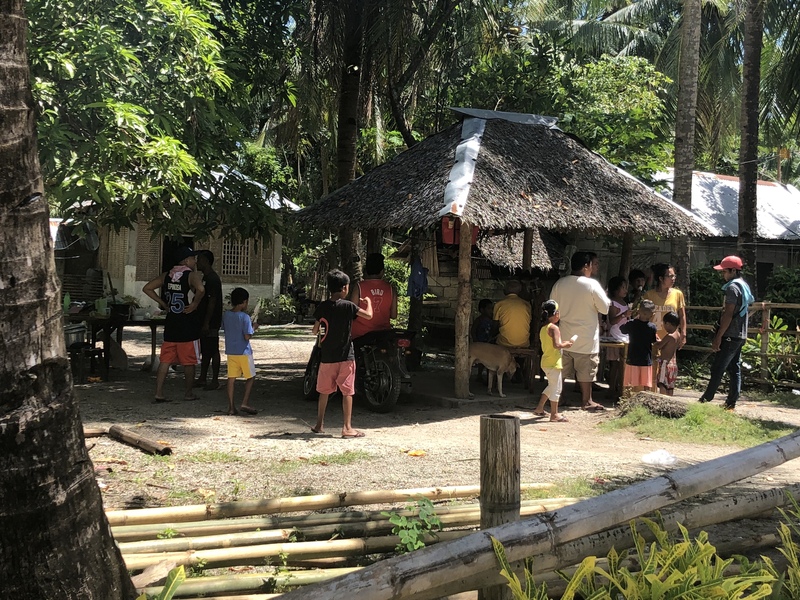 I have visited Thailand and India and have seen the poverty in those countries, but I saw it a little more in Manila and Boracay. The people are friendly and mostly genuine. 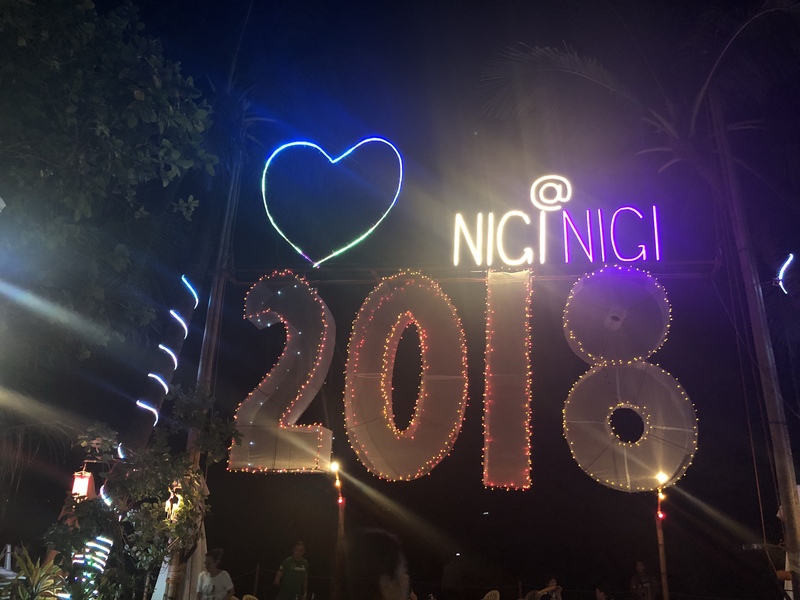 Unlike Thailand, where they put their all into tourists as being their main income, I got the drift that Filipinos are welcoming yet they like their culture and will not change it to suit tourists (many people do not speak English). I like this. Yes, there are tonnes of bars, restaurants and hotels for tourists, however, you still get to see the authenticity of the country. Crime is high for kidnapping so be wary if travelling solo, but honestly, its a great place to travel to. Let me know in the comments of any more recommendations, or whether you have a different outlook to me. Quote of the day: Focus on the powerful, euphoric, magical, synchronistic, beautiful parts of life and the universe will keep giving them to you – unknown. Fairways and Bluewater’s infinity pool. Such a lovely blog, feel I’m actually there! This is definitely on my bucket list. 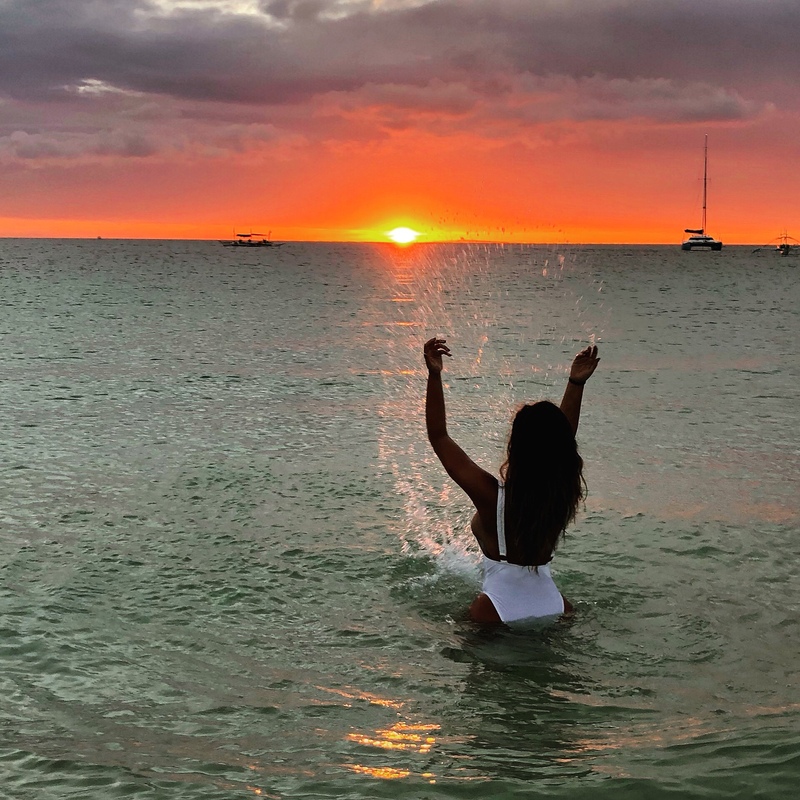 The sunsets are amazing, the beaches paradise. Looking forward to more amazing adventures with yourself and Bella the pink flamingo. Happy holidaying and God bless you. This is certainly a place I need to consider when travelling . 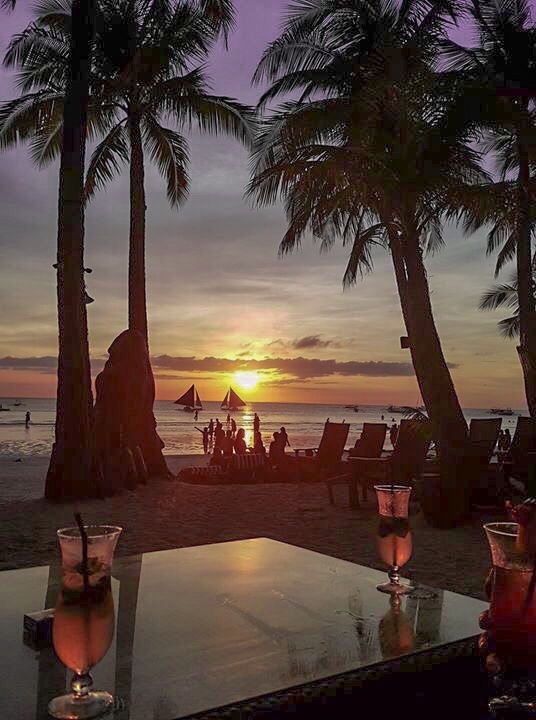 Great to know you enjoyed your stay in Boracay. Please do visit the Philippines again especially the parts of Palawan and Cebu! Thanks for visiting my blog by the way. I loved your posts! I most certainly will! 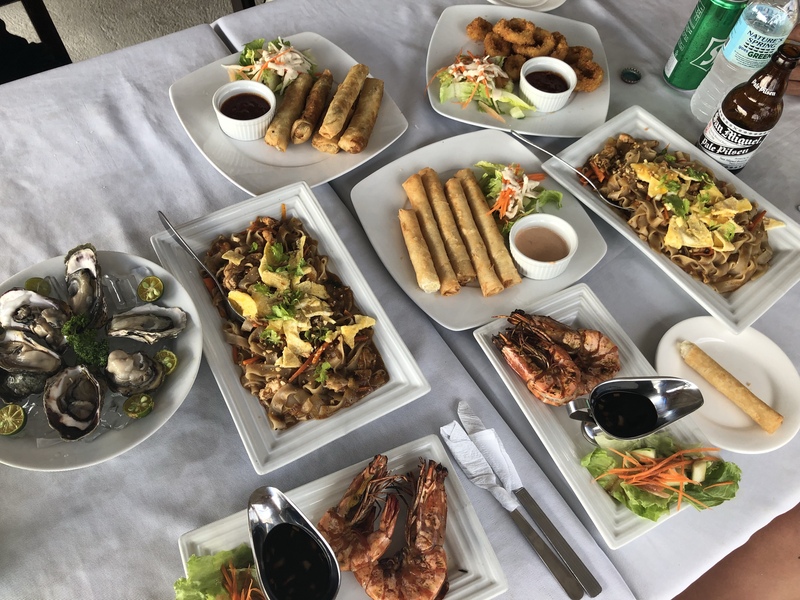 I fell in love with the Philippines. Thanks for your response. Take care ! so many wonderful flashbacks whilst reading this blog. this was the most amazing vacation! the best company. we never laughed so much. 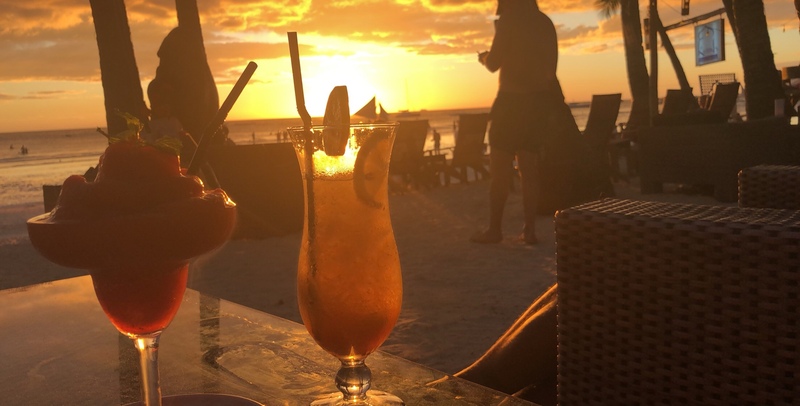 delicious food, flamin hot fire shots, sunsets out of a movie & crystal clear waters. ambassador bar was my all time fav! even during the tropical storm, memories to last a lifetime! peddle boarding in the rain FYI you owe me a trip back to thailand to replace my beach cover up from koh lanta that u lost in the sea LOL. so excited for bella to travel the world! where to next? ……. shes fully booked up this year! we are sharing! It Looks soo magical, really authentic. I trully did not consider the phillipines as a viable holiday desination :0 but boy was i wrong! It/ you looked amazing! I loved reading this. It was such a helpful and fun read. Made me wish Boracay was my next holiday destination tbh. What a fantastic place. Great pictures. Lovely read! 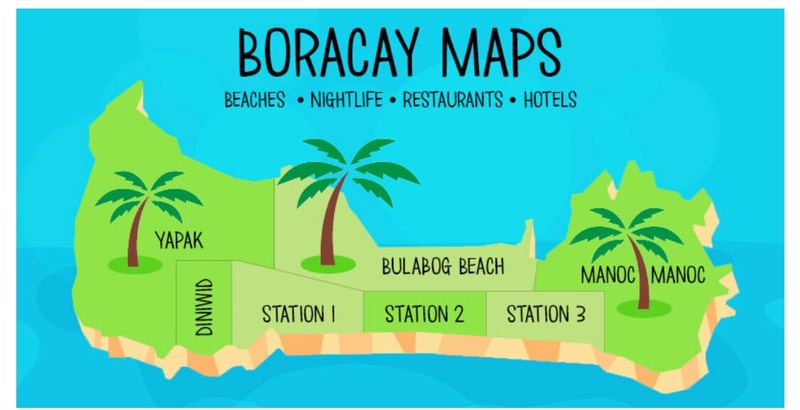 We are planning to visit boracay this summer so this has been very helpful! Cannot wait to see the white beach your photos are amazing! Excited for your next destination blog! The experience you shared was truly beautiful. Hope the world sees it like we do. This is treasure! I need to save it if I’ll ever go there. Thanks for posting it!! If you do let me know how you found it! Sadly when I visited Boracay, I was sick and the weather was bad all week. Hope you got the chance to visit other islands as the Philippines in incredible. Great pictures! Next PostNext Miami food spot: Sagrado pastry and coffee shop.